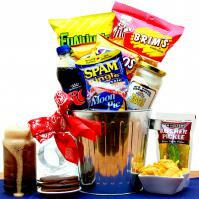 Father's Day gift baskets, gifts and presents for Dad and all the special men in your life. Fathers Day gift basket include delicious gourmet food, executive gifts, sports gifts such as golf, fishing and unique gift ideas for fathers, step-fathers, new fathers, grandfathers, God fathers, husbands and all the father figures in your life. Gift baskets for him. Surprise him with unique gifts and presents. 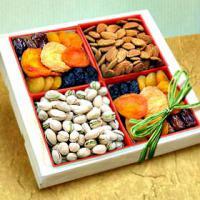 Buy birthday, anniversary, get well, thank you, holiday and all occasion gifts for a man. 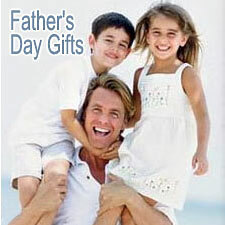 Find the best gifts for a boyfriend, husband, brother, father, sweetheart, boss, friend; every special man in your life. Send him high quality, all occasion gifts for men. Themes Include Delicious Gourmet Food, Executive Gifts, Sports Gifts, Special Gifts & Upscale, Unique Gift Ideas for Men. When seeking for men birthday gifts who says birthday baskets are meant only for women? At Adorable Gift Baskets, you'll find a surprisingly grand selection of men birthday gifts that can intrigue any man in your life. Whether buying for your husband, boyfriend, father, brother, cousin, or a male friend at work, our men birthday gifts are designed with men's preferences in mind. Featuring all sorts of sports gifts, edible goodies that will reach his heart through his stomach, and other "manly" items, you'll never go wrong with a men's gift basket. His birthday is sure to be filled with surprises as he explores all the treats and gift items in your thoughtful birthday basket. Does he enjoy playing golf? Then surprise him with a golf birthday basket featuring items such as practice golf balls and some sweet treats to take along as a snack while playing a game. A great complementary gift with his golf birthday basket would be a gift certificate to his favorite local golf course. Does he enjoy all kinds of sports such as football, baseball and basketball? You might include tickets to a game of his favorite team with a sports basket. 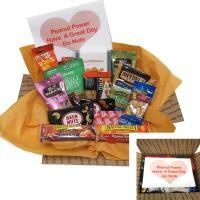 Sporty men birthday gifts by Adorable Gift Baskets can be delivered to his door with just the click of a mouse. For your dad on his birthday, you can delight him with a creative basket just for "Dad" overflowing with his favorite snacks. 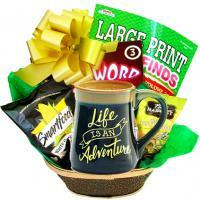 At Adorable Gift Baskets, you'll also find unique baskets for antique lovers, men who love to barbecue, the hard-working man, racing fans, and even fine men birthday gifts for the regular coffee drinker. For office co-workers or a company owner, Adorable Gift Baskets carries executive men birthday gifts with a professional twist. Whenever you need men birthday gifts that are out of the ordinary, you can easily browse our birthday gift basket selection at Adorable Gift Baskets from the comfort of your own home. You'll find exactly what you need for the men in your life at rates you can afford.